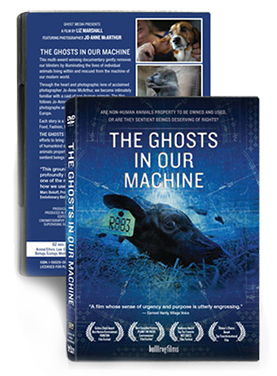 Purchase THE GHOSTS IN OUR MACHINE with Public Performance Rights (PPR), and host unlimited screenings in your community. Be the change – host a public screening! Purchase THE GHOSTS IN OUR MACHINE with Public Performance Rights (PPR), and host unlimited screenings in your community. Products are shipped by regular mail through Canada Post. To be safe, please allow up to 14 business days for your package to arrive. Download Toolkit to help promote your events. NOTE: For those in the USA you may license the film for public screenings through our educational distributor BullFrog Films. Your purchase comes with a Public Performance Rights License (PPR) which grants the Licensee the unlimited right to present THE GHOSTS IN OUR MACHINE (“the Film”) in public exhibitions in accordance with the following standard terms and conditions. By acknowledging receipt of the DVD, the Licensee acknowledges that it has read this contract, understood its terms, and has voluntarily accepted its provisions.